As the Empire reels from its critical defeats at the Battle of Endor, the Rebel Alliance—now a fledgling New Republic—presses its advantage by hunting down the enemy’s scattered forces before they can regroup and retaliate. But above the remote planet Akiva, an ominous show of the enemy’s strength is unfolding. Out on a lone reconnaissance mission, pilot Wedge Antilles watches Imperial Star Destroyers gather like birds of prey circling for a kill, but he’s taken captive before he can report back to the New Republic leaders. 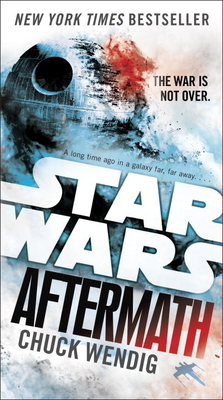 Meanwhile, on the planet’s surface, former rebel fighter Norra Wexley has returned to her native world—war weary, ready to reunite with her estranged son, and eager to build a new life in some distant place. But when Norra intercepts Wedge Antilles’s urgent distress call, she realizes her time as a freedom fighter is not yet over. What she doesn’t know is just how close the enemy is—or how decisive and dangerous her new mission will be. Determined to preserve the Empire’s power, the surviving Imperial elite are converging on Akiva for a top-secret emergency summit—to consolidate their forces and rally for a counterstrike. But they haven’t reckoned on Norra and her newfound allies—her technical-genius son, a Zabrak bounty hunter, and a reprobate Imperial defector—who are prepared to do whatever they must to end the Empire’s oppressive reign once and for all. Chuck Wendig is a novelist, screenwriter, and game designer. He’s the author of many novels, including Blackbirds, Atlanta Burns, Zer0es, and the YA Heartland series. He is co-writer of the short film Pandemic and the Emmy-nominated digital narrative Collapsus. He currently lives in the forests of Pennsyltucky with wife, son, and red dog.